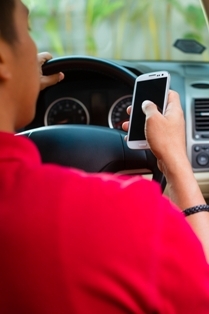 In 2014, texting or distracted drivers caused 3,179 fatalities and 431,000 injuries. Distracted driving involves operating a motor vehicle while performing any task that takes your attention away from the job of driving. When a driver gets distracted and looks away from the road, devastating crashes can occur. Not only do distracted drivers place their own lives and the lives of other drivers at risk, they can be held financially liable for the injuries they cause to others. Texting has become the most popular form of communication for many, with texting fans claiming it's easier and more convenient than making a traditional phone call. However, texting has been proven to be the most dangerous of all distracted driving activities, with statistics indicating that it increases your risk of a crash by 23 times. In comparison, dialing a cell phone increases your crash risk by 2.8 times, and talking increases your crash risk by 1.3 times. When a driver is texting, his hands aren't on the wheel. This slows reaction time in the event of an accident. If you're texting and driving, you're glancing at your phone instead of the road. It takes just a split second for a vehicle to pull in front of you or for a child to dart in your path. It's impossible to pay full attention to safe driving while you're texting. Multi-tasking creates unnecessary risk. Many people associate texting while driving with reckless teenage drivers, but adults are guilty of this offense as well. Recent studies indicate 34 percent of teen drivers and 27 percent of adults have sent or received text messages while driving. Voice-to-text features, while once heralded as a safer alternative, are just as dangerous as typing a text message. Since these features create errors in messages that have to be corrected manually, they create additional opportunities for distracted driving. Additionally, these features lull drivers into thinking they’re being safe when they’re actually putting themselves and others at risk. The only truly safe way to text is when you're pulled over or parked. A growing awareness of the dangers of texting and driving has caused the majority of states to pass laws restricting cell phone use behind the wheel. Currently, there are 46 states banning texting while driving by all drivers, one banning texting by school bus drivers, and two prohibiting text messaging by newly licensed drivers. Louisiana state law prohibits all drivers, regardless of age, from sending or receiving text messages while driving. Considered a primary offense as well as a moving violation, first time offenders receive a $175 fine. The second and any subsequent violations come with a $500 fine. Medical expenses. Reimbursement for medical costs includes hospitalization, surgeries, rehabilitative therapy, and medication. It may also cover future medical expenses. Lost wages. Reimbursement for lost wages includes time you were unable to work while recovering from your injuries, as well as any reduction in your future earning potential if your injuries have limited your ability to return to your previous employment. Pain and suffering. This category of damages provides financial reimbursement for the emotional trauma associated with being seriously injured in an accident caused by a texting driver. You can pursue a personal injury claim even if you were partially at fault for the accident, due to speeding, failing to stop at a stop sign, or some other violation. However, partial-fault drivers will have their available compensation reduced by their percentage of fault. Who pays for my damages after a car accident?